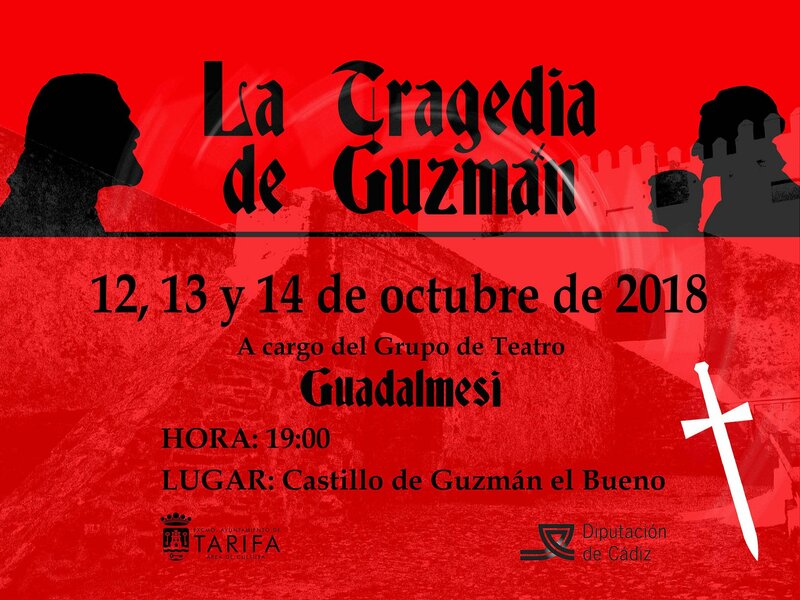 The cultural group “Guadalmesí” last these days the rehearsals of the new staging of the “Tragedy of Guzmán”. The area of Culture of the City Council of Tarifa in collaboration with the Diputación de Cádiz prepares a weekend with medieval airs in the Castle of Tarifa. The theatrical production will feature novelties with the participation of María Clavijo, from the “Dance School: Flamenco and Oriental”. Also in the precinct of the monument, the visiting public can contemplate a military camp of the time with representations of fights of knights included. The appointment with free admission is at the Castillo de Guzmán (access through the main door) on 12, 13 and 14 October with free admission until full capacity is reached. The defense of Tarifa by the León-born Alonso Pérez de Guzmán recognized as “El Bueno” has inspired throughout the centuries paintings, stories, romances, operas … Now, the epic of the warrior but also the sacrifice of his family return to the stage natural of the Castle of Tarifa with a montage promoted by the Culture area and prepared by the cultural association “Guadalmesí” under the direction of the Tarifeña Milagros Salvatierra. Among main papers like those of Alonso Pérez; María Coronel; “Hassan” the emissary, and ladies of the court or figurants are almost fifteen interpreters who will give life to the “Tragedy of Guzmán”. It has in common the love for the theater and the delivery that they deposit in each new work. The next weekend is not exactly a premiere because last year it was possible to see the “Tragedia de Guzmán”. From the opera “Guzmán el Bueno” of the nineteenth-century Antonio Arnao, Milagros Salvatierra and the rest of the group “Guadalmesí” created a free version of the tragedy of the León knight. This year is repeated but with news. What can be seen on Friday, Saturday and Sunday at the Castle, with free admission will not be exactly the same. In the first scene, reminiscent of entertainment and recreation in the time of the Reconquista there will be news. The romances and cantigas of the lady Mari Carmen Tizón or the troubadour Ángel Sena will be interspersed with the oriental dance of María Clavijo. Another novelty will be in the costumes of three of the main interpreters, prepared in the Tarifeño workshops by the designer Nacho Blanco Peralta. The rest is rented for the occasion in specialized stores, but little by little, the cultural collective does not renounce to go creating a costume around a theatrical show that was formed with a vocation for continuity. “The tragedy of Guzmán” tries to tell another way a passage that has inspired the world of letters, painting or music. The director of the show wonders about the possible contradictions of Alonso Pérez, a warrior at the service of the court but also a man. That without ignoring the pain of María Coronel, honest but hurt. In short, Guadalmesí seeks a new version of one of the historical moments of Tarifa and Spain. It will be at the foot of the old church of Santa María, inside a walled enclosure, but this time it will be accessed through the main door of the Castle. From there you can see a military camp of the time and fights of knights staged by “Andalusia Medieval”. Admission is free until full capacity is reached. Each of the daily performances is set for 7:00 p.m. The military camp can be visited from half an hour before, starting at 6:30 p.m. and also in the morning, at 12:00 p.m.